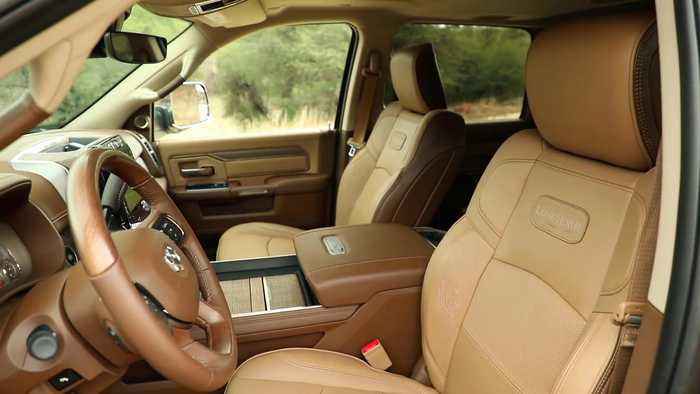 For 2019, all-new features, technology and premium materials help the redesigned Ram Heavy Duty continue its interior leadership with quality, technology and luxury. Each trim level is uniquely characterized to reflect individual identity. The new instrument panel combines a strong, structurally interlocking appearance, pushing the central controls up and toward the driver, improving overall reachability of system controls. The 2019 Ram Heavy Duty features the Uconnect 4C NAV on a 12-inch fully configurable touchscreen, which can display one application, such as the navigation map, across the whole 12-inch screen, or can be divided in half, operating two different applications at once. Redundant HVAC controls and a new enhanced-ergonomic switch bank deliver improved feedback and appearance. The new 2019 Ram Heavy Duty features an available 7-inch, full-color, 3D animation-capable driver information display, with reconfigurable function that enables Ram truck drivers to personalize information inside the instrument cluster. The display is designed to visually communicate information, using graphics and text, quickly and easily.